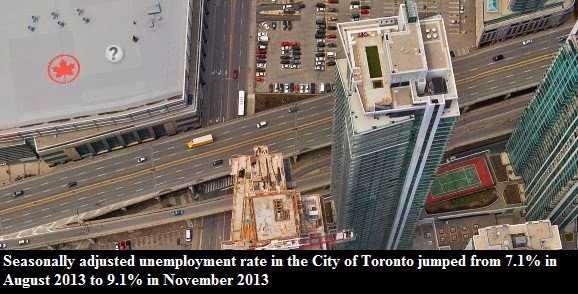 Does Toronto have a Strong Labour Market? With all the recent layoffs in the news, one might wonder how strong the labour market really is. For those who missed it, BMO is cutting 1000 jobs, Sears letting go of 800 staff, Sun Media is laying off 200 staff, Kellogg's is closing a cereal plant in London and thus eliminating 550 jobs. Finally, early next year, Mr. Christie's bakery in Toronto will be closing its doors and leaving several hundred employees without a job. Though I'd like to discuss the Canadian labour market today, I don't have the necessary data. But I do have stats for the City of Toronto thanks to their open data portal. According to a labour force survey in November 2013 there were roughly 1.3 million employed residents in the City of Toronto. 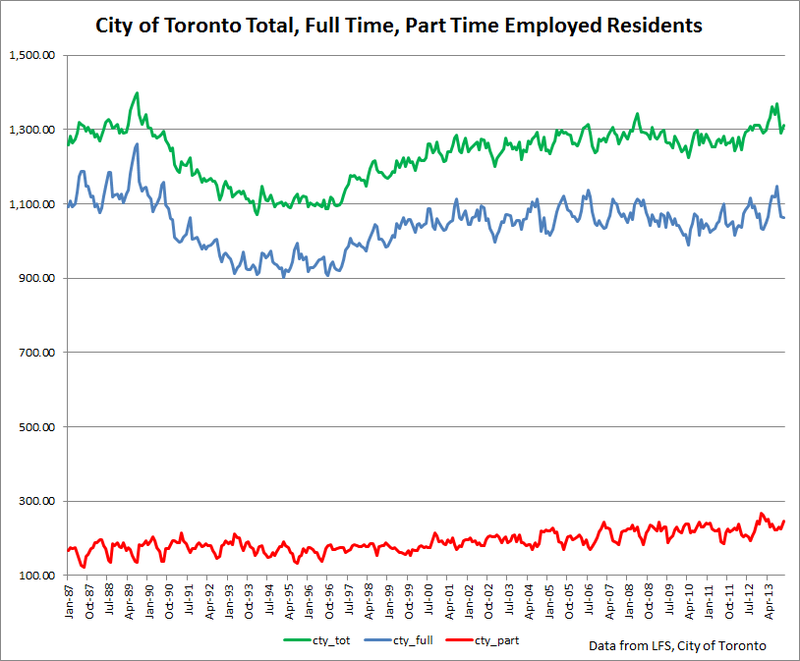 81% of the city's employed residents worked full time and 19% worked part time. Total employment in the City of Toronto peaked in August 1989. Back then there were roughly 1.4 million employed residents. Fast forward to November 2013, and only 1.3 million residents were employed while the age 15+ population in the city grew by over 150 thousand. One reason for this is that the unemployment rate jumped from 3.3% in August 1989 to 9.1% in November 2013 (seasonally adjusted). 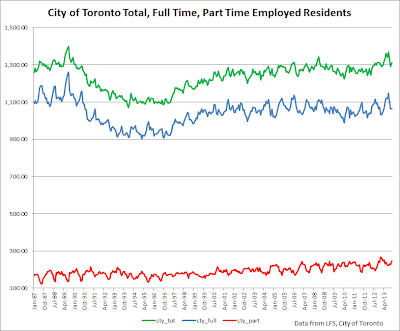 What is even more worrisome is that the number of full time employed residents has stagnated for the past two decades and a half as demonstrated by the graph below. 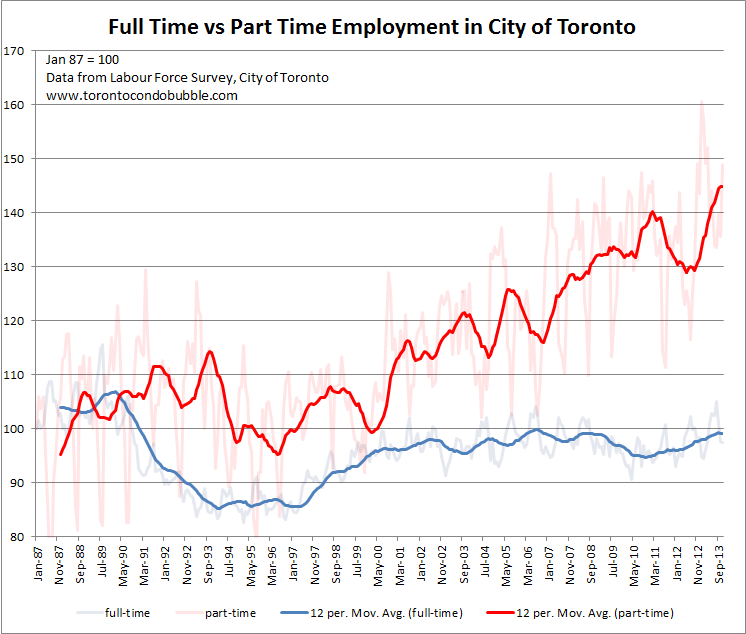 Since 2000 it was only part time employment that grew in the City of Toronto while full time employment held steady. Does Toronto (416) has a strong labour market? You decide.